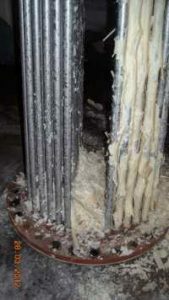 Limescale or other salts are found in their dissolved form in almost every water. In common language limescale or calcium carbonate is causing hard water. Technically speaking, depending on the temperatur of the water, the solved minerals / salts start to percipitate. They form deposits or incrustations on surfaces. This process is also called scaling. Limescale are mineral deposits of mainly calcium which form stains, in kettles, dishwashers or shower doors. At home, in your shower this is just bothersome. People has to remove regular the stains and deposits. Using vinegar and scrub hard to get rid of these mineral deposits. In an industrial boiler, a condenser or a heat exchanger scaling and the reulting deposits can easy create problems. Malfunctions in the process, a big effort for cleaning, to talk only about two common problems. The heat transfer is reduced by incrustations, this will increase energy cost. To avoid such critical problems water is treated or conditioned. The classical way to do is to use a water softener or other chemical ways to condition the water. But such treatment is expensive, you have regular cost and effort. Treating hugh amounts of water is either not possible or very expensive. If one uses seawater for cooling and this is chemically treated all the chemicals go back in the sea. And pollute the sea and the fish. We agree that in the pharmaceutical or chemical industry the process water has to be free of lime scale. Nevertheless in utilities, like cooling water, the water has not to be free of limescale. 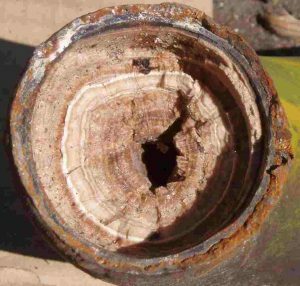 It has to be assured the limescale is not causing technical problems, and this is achieved by the Merus Rings. Merus proved for over 20 years, in several thousand industrial installations. Merus Rings keep the scaling under control ! Means the cooling is working properly, the processes dont suffer under insufficient cooling or heating, there is no leaking due to corrosion in the pipe network. In most cases there is far less or no chemical treatment at all required, to achieve acceptable results. In a lot of cases our industrial customers do both. Using chemical treatment and Merus Rings. We have reports from customers, the use of chemicals are reduced by half. See the official report of the chemicals used in a steam boiler. We at Merus think the Merus Rings are a perfect limesclae protection. Try it.